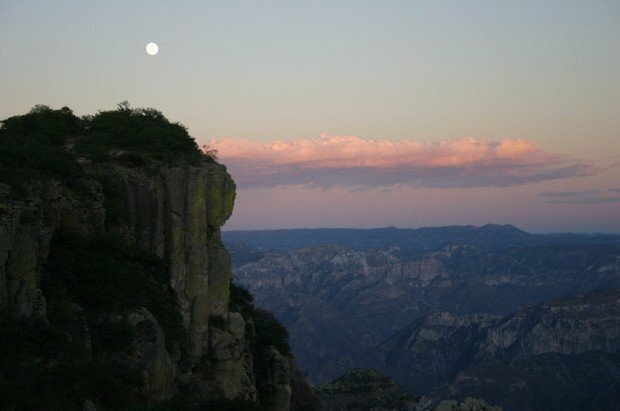 A full moon rises over Copper Canyon in Divisadero, Mexico. Copper Canyon is actually a series of awe-inspiring gorges even bigger than the Grand Canyon. 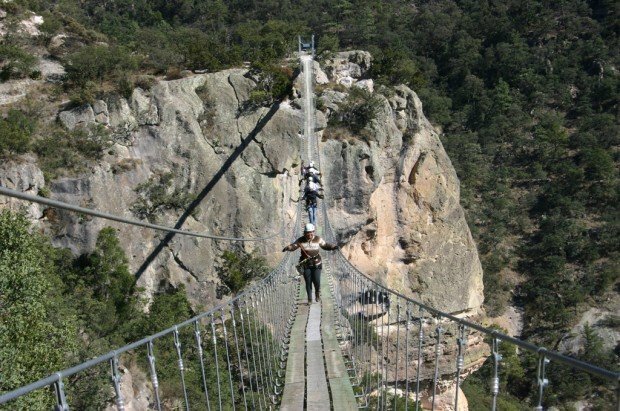 A tourist crosses one of three hanging bridges at Copper Canyon. They can be scary, but so is the van ride in, and don't even ask about the zip line..
A section of track is left behind by the caboose of El Chepe, a government-run train celebrating its 50th anniversary transporting tourists and commuters from Sinaloa to Chihuahua. CHIHUAHUA, Mexico - I won't lie: I had some qualms about traveling alone to Copper Canyon, a series of awe-inspiring gorges bigger than the Grand Canyon that happen to be in the same northwestern region of Mexico consumed by drug-trafficking violence. I'm glad I shrugged off the doubts. My trip to Las Barrancas del Cobre, as they are known in Spanish, was a great adventure. And I can confidently say that traveling here is safe - especially if you stick to the route of El Chepe, the government-run train that this year celebrates its 50th anniversary depositing tourists and commuters along a 400-mile stretch from Los Mochis in the Pacific coast state of Sinaloa to Chihuahua city, capital of Chihuahua state. The canyons themselves are all within Chihuahua state's borders. There were moments off the train that gave me pause, such as when a native in the old silver mining town of Batopilas remarked, "Here, we see nothing, we hear nothing and we say nothing if we want to wake up alive each morning." In that same town, where the drug-fighting military keeps a high profile, I took pictures of attractive, colonial-style building facades before realizing that at least two of them bore more than a dozen deep holes that could only have been rendered by the bullets of a high-powered weapon, the kind favored by Mexican drug traffickers. As I wandered through the narrow streets, men tipped their cowboy hats in deference, young couples and children posed amiably for photographs, and museum guides and hotel owners were eager to educate me on the town's rich mining and Indian cultural history. The scariest part of my trip was getting there, in a small van that for much of the 4 1/2-hour trip swerved, bounced and braked as it made a precipitous descent from nearly 7,900 feet to 1,840 feet on unpaved, switchback roads with no guardrails. Then there was a different type of scare, one that I chose: I zip-lined at heights of up to nearly 1,500 feet over Copper Canyon and tap-danced across two wobbly hanging bridges, albeit while wearing a helmet and being firmly attached to a steel cable that would prevent me from catapulting over the edge and into the depths. The scenery was thrilling too: The cliffs of the 5,900-foot-deep Batopilas Canyon glowed red in the sun, sharp-edged mountain peaks repeated themselves in a visual bluish echo far into the distance, and a brown river that from above looked to be the width of a thread twisted across the canyon floor. During my one-night stay at Copper Canyon, a gorge named for the entire range, a full white, button-size moon rose above cliffs darkening into silhouettes as a dying sun infused horizontal cloud strips with pink and orange blush. The Posada Barrancas Mirador hotel is literally built on the rim of the canyon. In the past, it was jammed with tourists, but I was one of only 17 guests on a night in early November. That meant the Mirador's "happy hour with a view" felt less like a moneymaking diversion for tourists and more like a small, pleasant gathering of friends. As I sat in a comfy leather chair sipping a local grain alcohol known as Sotol in front of a fireplace, I fantasized that this was my private lodge to which I had invited a few guests for a quiet evening. "Usually this time of year, we'd have about 120 people here," said the hotel's client services manager, David Varela, referring to the large groups of U.S. tourists who have always been the region's biggest clients. Back in the good days, Varela noted, every season was "high season," except August and September. But the global economic crisis, the 2009 swine flu scare and a steady increase in and attention to Mexico's drug-related violence have devastated tourism throughout the entire Copper Canyon. Now Americans stay away while Mexicans, who never had much interest in visiting the region, are starting to respond to a nationwide campaign urging citizens to explore their country, Varela said. Still, he says this isn't nearly enough to make up for the overall loss. To those who stay away out of fear, I would simply say: Don't. First of all, El Chepe (the train) is patrolled by heavily armed state police officers who are there to stop any potential robberies or assaults. You take one look at them and you know they mean business. One of them, Hugo Sergio Guerrero Lazo ("guerrero" means warrior, by the way), told me he hasn't seen any problems during the 2 1/2 years he's been on the job. Second, if you decide to take one of the hundreds of hiking trails or to camp in canyon sites far from the train tracks, hire a guide who knows the area. There are plenty of them and they are all looking for work. As a woman traveling alone, I found the best way to explore Copper Canyon was to jump on and off El Chepe and stay in hotels built specifically along the route for train travelers. Nearly every day of the journey, I met people from all over the world who agreed with me: This trip is worth taking. • El Chepe: www.chepe.com.mx/english/index.html . In late fall and early winter, take the route that starts in Los Mochis and ends in Chihuahua; otherwise it will be too dark to see some of the best canyon views. Tips: Due to Copper Canyon's wide range of altitudes, weather varies dramatically, from hot, summerlike temperatures to near freezing. Some tour groups accept only cash, so be sure to get it in Chihuahua, Los Mochis, or El Fuerte; don't count on ATMs.